This java tutorial shows how to use by example the valueOf(char data,int offset,int count) method of String class of java.lang package. This method returns a string representation of a subset of character array data. The subset is determined by the the method parameter offset and count. The method valueOf(char data) returns a String object which is the String representation of a subset of char data as specified by method argument offset and count. The java method, String valueOf(char data) should be accessed statically thus we should do the following String.valueOf(char data). This is basically one way to print a character array in subset form. It means to say that we are only getting the characters at specific indexes as specified on the method arguments offset and count. 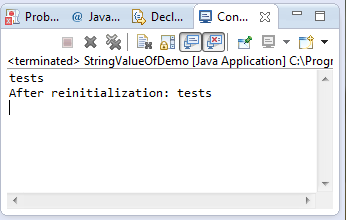 This java example source code demonstrates the use of valueOf(char data,int offset,int count) method of String class. On this java code, we have declared a character array, and then we have printed the return String of method valueOf(). As you would noticed on the code, we have reinitialize the data character array into new values to prove our postulate that any change later on our array will not change the initial String value extracted in invoking valueOf(). This is because we take a copy of the string equivalent of character once we invoked the method valueOf(). There’s an interesting method we have used, the String.toCharArray() to convert a String into character array.